Located on Three Notch Rd., Extra Space Storage is accessible for residents living in Lexington Park, Great Mills, Wildewood, and California. Locals will recognize our facility next to Esperanza Shopping Center between Maple Rd. and Millstone Landing Rd. We're also convenient for residents of nearby apartments, such as Villas at Greenview, Laurel Glen Apartments, Settler's Landing Apartments, and more. 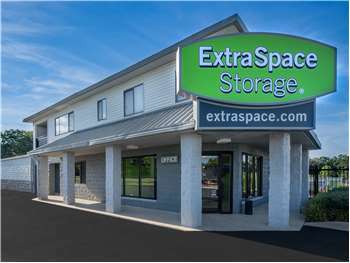 Our Lexington Park facility offers a variety of storage unit sizes that are able to accommodate almost any storage need. Whether you're in need of climate-controlled storage, vehicle storage, RV parking, or just a place to keep a few things while moving, Extra Space Storage can help! Starting at 4x4 and going all the way up to 20x20, we have a variety of storage unit sizes, plus features like climate control and unit types like drive-up access to handle whatever you need for self storage. Need to store temperature-sensitive items? We offer climate control in almost all storage unit sizes. This feature keeps your unit at a temperature between 55°F and 85°F year-round, protecting your belongings from damage caused by extreme heat or cold. Do you need vehicle storage in Lexington Park? Our facility on Three Notch Rd. has large drive-up storage units and outdoor parking spaces that can accommodate cars, motorcycles, boats, and RVs. Car & Motorcycle Storage: 10x10 and 10x15 sizes are perfect for storing motorcycles while 10x20, 10x25, and 10x30 sizes are better suited for cars, vans, trucks, and some commercial vehicles. Boat & RV Storage: If you plan to store a boat or RV inside a storage unit, we recommend 10x30 or 20x20 drive-up units. If you want outdoor storage, we have 8x20 and 9x24 parking spaces available. When you store with Extra Space Storage, you'll get a customer service experience that's second-to-none. From our clean, secure facility, to our friendly, professional staff, our Three Notch Rd. location is the storage solution you want in Lexington Park. Reserve your storage unit today! Clean, secure facilities, managed by a knowledgeable, friendly, and helpful staff. They also have packing materials and boxes available for purchase. A one-stop shop for all your storage needs. Great customer service and clean easy to use units. Nice promotion free month. Security cameras around the property is good. This is my first experience using self storage. The center manager walked me through the process and made the transition much easier. Satisfied with personnel and storage facility location and convenience as a whole, but am not satisfied with $30.00 rental rate increase in almost 3 years. Rate needs stabilization. Very clean place and the ladies there are very knowledgeable. Will continue to store there just because of the customer service. This place has great customer service and affordable prices! There are various security cameras around the premises, the place is fully gated and they even have police patrol the area. The whole site is well maintained and clean. I highly recommend this storage place, even so for military as they offer a good discount. We would highly recommend this storage facility to anyone, It's clean, secure, monitored 24/7, a friendly and helpful staff. Reasonable prices, and good size units, from small to extra large. This facility offers boxes, locks, packing wrap, tape,,,you need it, they have it! We rate this facility with 5 stars out of 5.. I know a policeman in the area and he gave me thumbs up for safest storage facility in my area. The facility is spotless and the people who work there are extra helpful and always concerned about my satisfaction! I rented with Extra Space Storage for 9 months. The unit was very clean upon arrival. All items that I retrieved were in the order that I left them. The area was well lit and I didn't fear going there even after dark. There was plenty of space to get the moving truck in and out. We did have a little issue with the mice destroying some wicker baskets, but damage was minimal. The customer service was phenomenal and not just once, but every time! I would definitely store with them again. Thanks Extra Space Storage!!! Excellent overall. Great customer service and the manger is amazing. Best place in town. I have tried two other self-storage places locally, and this one is the cleanest and most organized. I moved my stuff out of the others because even though it was inside it was getting dirty and ruined. Plus I had to deal with bugs and spiders. So I came back to Extra Space and I do not regret it. No more unexpected dust and grime, and no more spiders. Its my third time back! I needed a short term storage solution when I was moving into the area. The folks were friendly when I first contacted them from halfway across the country. I was allowed to reserve a space for a minimal fee before I moved out there, and it was ready for me upon my arrival. I was cheerily greeted when walking into the office and was treated generously when filling out the necessary paperwork etc. The salesperson was able to secure me a good deal and were willing to work with me to meet my needs. I also liked the security at this particular location. MUCH better than other storage companies in the vicinity that I looked at. Very satisfied and will rent there again if I need Extra Space. First time renting space and was very pleased with the people, the unit, the security and the cleanliness. Every time I went to the unit the area was well light, very courteous staff available and someone was always checking units and cleaning. Not just inside, but outside as well. Overall very affordable. Would definitely use again. I first called to see if they had a climate controlled unit available and was treated to great customer service on the phone with knowledgeable personnel. Next went in to complete the rental and was greeted with the same service and they knew my name from the phone call. The facility was very clean and when a cart was not readily available near our unit, the employee went and got one for us. I was very impressed with the security features as well leading into the inside units and the cleanliness of our specific unit. The facility is very clean. The employees are always helpful. the only problem is that my rent is always going up. To Whom It May Concern,I've been with extra space storage since Sept. of last year and I have nothing but good to say about my experience. The service was great, the people were nice,thoughtful and helpful if needed always!!! Unfortunately November will b my last month but if any body needs space I know where I will suggest they go. Many thanks to Kris, Matt, and Anica. God bless and I'm out !!!!!! The Cougar Diva........................... Love u guys!! Good luck!!! This facility is at a convenient location for our camper with easy access to our vehicle and a super friendly staff. What else can i say? The price is spot on, it is easy to get in an out of, the staff is truly customer oriented. Well organized, great hours, great location. Cooperative staff. I moved from Maryland to Texas in 2006. I continue to have items in storage. Being so far from my facility and at times concerned with weather issues I have been given the relief I need. I am known on a first name basis and have been called to be reassured that all is well from time to time. I always call to make sure the staff is doing well and if there is ever a concern where to reach me. From the first time I came to rent a truck. The staff was so wonderful and we decided to also get my storage unit from them. It save me money on the rental truck and that maded it a one stop trip. I would like to thank everyone (don't remember names) for all your help. I wanted a 5 x 10 storage space, and to my delight I got an outside drive-up unit with TWO doors! This made it so easy when unloading my car and putting my household goods in the unit. The facility is located right next to a U-Haul business which will make it even easier when I get a trailer and have to pack up and move cross-country. How convenient! The facility is clean and my household goods remained dry and safe even though we had Hurricane Irene pummel the area. Go South on Rt. 4 make a left at light on Rt. 235 (WaWa is on the corner). Proceed South on Route 235/Three Notch Road for 3 miles. Our facility is on the left side northbound lane. Make a U-turn at stop light at Millstone Landing Rd (Taco Bell is on right and Twist Wine & Spirits is on left). After U-turn get in the far right hand lane and turn into our facility after the Hertz Rent a Car sign. Head North on Route 235/Three Notch Road. Once you pass Twist Wine & Spirits get into the far right hand lane after the traffic light and turn into our facility right after the Hertz Rent a Car sign.